Moment of Destiny was written to correct a terrible wrong, to heal an old wound. In July 1940, when the European Democracies collapsed before the Nazi war machine, only Britain stood defiant, but alone and vulnerable. Ambassador Kennedy wrote Britain off as a lost cause. Churchill decided to show the world Britain’s ruthless determination to fight on. Tragically the issue on which he made his stand was the fate of the French Fleet, then one of the most modern in the world. To prevent their falling into fascist hands, in July 1940 Admiral James Somerville was ordered to open fire on the French squadron at Mers el-Kébir. 1,300 French sailors died, and a huge opportunity was lost. This book examines the possibility that Admiral Somerville might have acted in a different manner, in the best traditions of the naval commander on the spot. Suddenly the course of the Second World War begins to change, and with it the history of the entire world. The Mediterranean will become an Allied lake, and new opportunities open up. The vast fleet of Royal Navy warships – 1 battleship, 2 carriers, 1 monitor, 17 cruisers, 3 fast minelayers, 64 destroyers (plus 1 depot ship) and 45 submarines – which would otherwise be sunk, plus dozens damaged, in the Med, is instead saved for service elsewhere. Rommel will be sent not to North Africa, but to the Caucasus. Barbarossa begins as per Hitler’s original schedule, rumbling over the roads in what was eastern Poland. When the Russian Winter bites, the Wehrmacht is hundreds of miles east of Moscow. Faced by overwhelming Allied naval and air forces concentrated in the Far East, the Japanese are forced to change their expansionist plans. Pearl Harbor, the Philippines and Malaya are not attacked in 1941, and they turn elsewhere to find the fuel resources they crave. The first atom bomb is not dropped on Japan….. Unlike the usual collection of unconnected chapters found in most alternative histories, I have followed my story through to its logical conclusion. Faced with new possibilities, I have always chosen the one I personally felt was the most logical, and which then led to other possibilities. One after another, the dominoes fall, but in a slightly different direction. The hardcover copy is a First Edition, published by Trafford. Based on feedback from the First Edition, the enlarged Second Edition refines certain aspects of the story, and adds significant eye-witness accounts of the aerial combats over the Atlantic and in the skies of Eastern France. The dive bomber concept is finally vindicated, and Roosevelt’s undeclared war against Nazi Germany is revealed. The Second Edition will soon appear as a print-to-order book from Amazon. If you have purchased the old First Edition hardcover copy, the corrections and additions are available here. 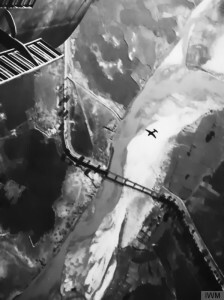 Vultee Vengeance dive bombers attack an enemy bridge. “5 Stars. Enjoyable Alternative WWII from a Francophile. 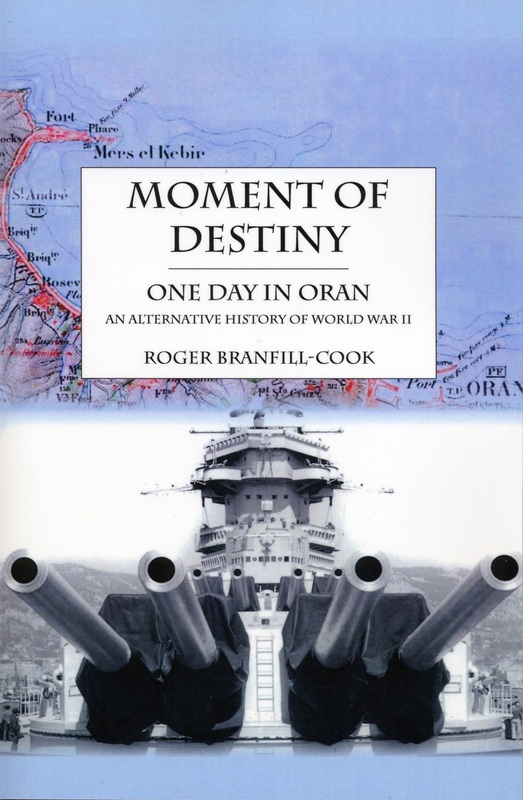 Roger Branfill-Cook writes an interesting alternative history in which the French Navy plays a large part in ensuring an early Allied victory. The great naval battle in the Indian Ocean which broke the power of Japan was very vivid. Use of illustrations and personal accounts of the different battles was excellent. British failings are not ignored but not excessively highlighted. I enjoyed this book and give five stars.” Reviewer; Adam Smith, Amazon customer. “5 Stars. This book was an eye-opener. I had always dismissed the French navy along with their army. To discover that the Brits had helped them build one of the most modern fleets in the world in 1940, then tried to destroy that fleet, was just inconceivable. The author has given me a new perspective on the Second World War. Shame it never turned out this way!” Reviewer: David, Amazon customer. “5 Stars. Quite brilliant. A well-written and intelligent ‘what if’. A completely logical story, telling the results of an honourable man’s decision not to follow orders. Great.” Reviewer: technophile, Amazon customer. “5 Stars. Great book, very thought-provoking and very enjoyable. A good alternative history yarn. Fully recommend it.” Reviewer: Jonathan, Amazon customer. “5 Stars. Excellent, many thanks.” Reviewer: bugwitt, Amazon customer.